Happy birthday Barbara O'Connor (How to Steal a Dog), Pat Cummings (Clean Your Own Room, Harvey Moon! ) and Lois Ehlert (Chicka Chicka Boom Boom). It’s the birth date of Kay Thompson (1909–1998), Eloise. Mary Robinson is elected Ireland’s first female president in 1990. Read Madam President by Lane Smith and Madam President: The Extraordinary, True (and Evolving) Story of Women in Politics by Catherine Thimmesh. It’s Chaos Never Dies Day. Read Absolutely Normal Chaos by Sharon Creech and Theodosia and the Serpents of Chaos by R. L. LaFevers. World Freedom Day commemorates the fall of the Berlin Wall. Read The Wall: Growing Up Behind the Iron Curtain by Peter Sis. On November 9, 1731, American astronomer, mathematician, clockmaker, and surveyor, Benjamin Banneker, called “the first black man of science,” was born in Elliott’s Mills, Maryland. Banneker published an almanac, becoming the first black man to do so. His life has been frequently presented in books for children, including Andrea Davis Pinkney’s Dear Benjamin Banneker. When I was Publisher of Children’s Books at Houghton Mifflin, one day I picked up a small manuscript, just three pages in length, which literally sent a chill down my spine. It presented the story of Benjamin Banneker in a way that I had not encountered, told by African-American storyteller and authorAlice McGill. The finished book, Molly Bannaky, still gives me chills. Molly Walsh, a servant girl in England, spills her lord’s milk and is sentenced in a court of law. Because she can “take the book,” or read from the Bible, she is not executed but sent as an indentured servant to the colonies. There Molly works hard, becomes a free woman, and heads out to start her own farm close to the wilderness. But she needs help and, consequently, she buys an African slave, promising to free him after a period of time. After they fall in love, Molly once again breaks the law by marrying a black man. However, the couple gains the acceptance of their community; they help neighbors and raise their children and grandchildren. In the final scene, we see Molly teaching her grandson how to read and recording his name in the family Bible—Benjamin Banneker. By telling Molly’s story, Alice McGill examines an aspect of Colonial America that rarely gets discussed in children’s books, the life of an interracial couple. As the grandson of a slave, Benjamin Banneker would have been denied access to books. But because of his grandmother, he received the gift that he needed to become an intellectual—the ability to read. Artist Chris Soentpiet extends the story in his luminous watercolors. A large-format book, the characters seem bigger than life, their story bold and important. Chris delights in historic research, the telling detail of a composition. 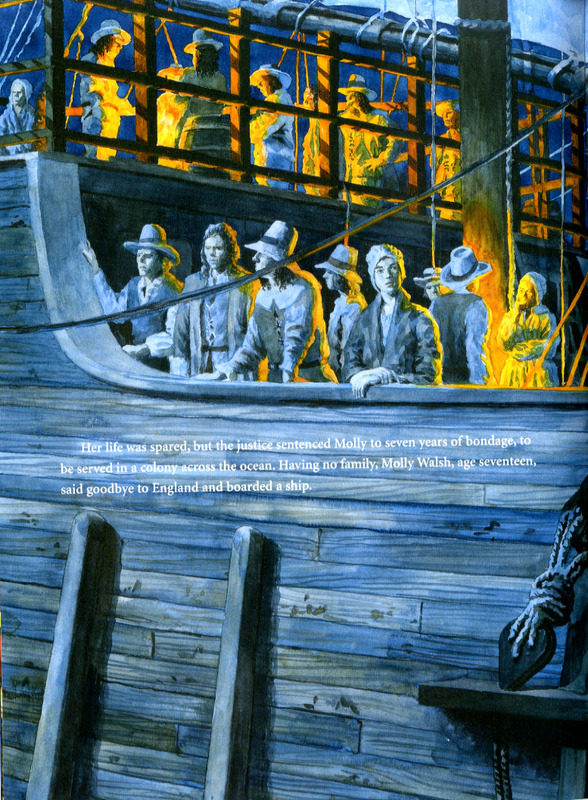 The book makes it possible for children to feel they have walked back into Colonial America. 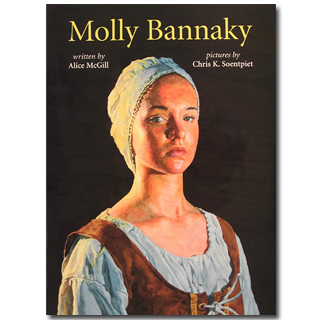 A spare, lyrical text, lush and vibrant artwork, and an important story from a different point of view all add to the power of Molly Bannaky. Happy birthday Benjamin Banneker. I’d like to celebrate this day by recognizing all the grandparents who have kept literacy alive in their family. They have truly made a difference, not only in their own families but also to the world. Originally posted November 9, 2010. Updated for . Thank you, Anita, for once again introducing me to a book I’d never heard of! I’m ordering this one now. The Maine Humanities Council uses this book, and many others on the website, in our New Books, New Readers discussion series for adults. Many of our participants dropped out of school for various reasons. Books like this provide them with “accessible history” and well as plenty of topics for discussion. We love Chris Soentpiet. Check out his illustrations for Coolies, written by his wife YIN, for the values that helped the Chinese immigrants who came to the West Coast to work on the railroads. Both books are perfect for even 6-8th graders because so much information is contained in the pictures! Wow, I’ve never heard of this book! What beautiful illustrations … The cover looks like a Vermeer. Do you know how much of the story is true? Tobin: There are only a few documents about Molly’s life — land deed, marriage record. Alice McGill found what she could at the State Library of Maryland. But because she kept the text brief, she does not stray far from what we know, merely the bare outline of Molly’s life. My son and I just read this (because of your recommendation) and we both loved it. Don’t Cry Over Spilt Milk has a new meaning at our house now, because we figure if you get sentenced to death over it maybe a few tears are in order. Beth: Thank you for this feedback — glad to hear you loved the book. Very nice to see Molly Bannaky featured here on the Almanac. I art directed and designed this book. Illustrator Chris Soentpiet was a joy to work with. Curious to know if it’s still in print. As I recall the hardcover trim size was quite large. 11 x 17?